…has to be when it’s too windy to build a wind turbine. The blades have been assembled on the ground and are currently tethered to the crane, but the installation team now need 3 hours of fairly calm weather to lift the assembly into place. The wind speed needs to drop below 6m/s – it is currently 14m/s, with stronger gusts. Great for electricity generation, just not for construction! 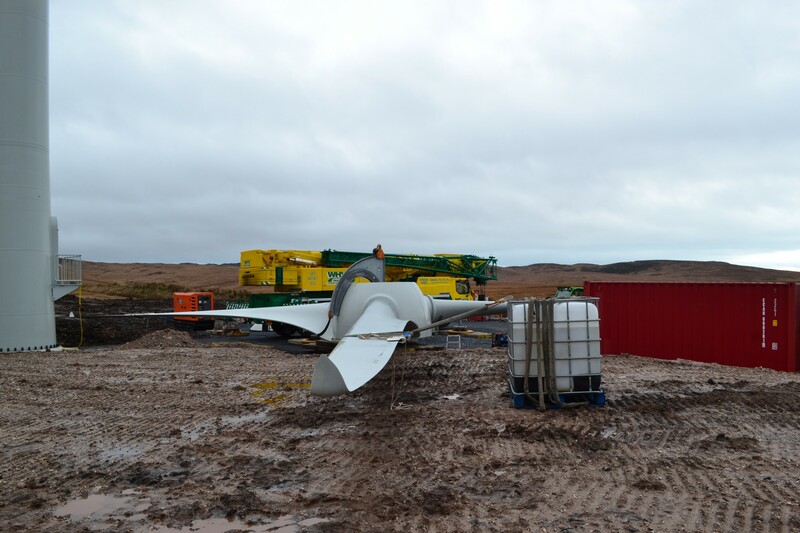 This entry was posted on Thursday, October 23rd, 2014 at 2:45 pm and is filed under Islay Energy Trust. You can follow any responses to this entry through the RSS 2.0 feed. You can leave a response, or trackback from your own site.